Bet on Millionaire lottery online! Love playing a 5 from 50 and 2 from 12 lotto? Millionaire has a 5+2 game format just like Europe’s biggest lottery, and whatever the jackpot is, we'll match it! Huge Jackpots and bet for just £2 every Tuesday and Friday! We offer huge jackpots available every Tuesday and Friday, at just £2 a bet! Also watch out for our special boosted jackpots which can go as high as £200 Million. How do I place a bet on Millionaire? It couldn’t be simpler! Just select 5 numbers from 1 to 50 and 2 extra numbers from 1 to 12. You can also choose your numbers by selecting our QuickPick (Quick+1) option. After that, all you need to do is submit your bet. We have a Guinness World Record! It’s official. 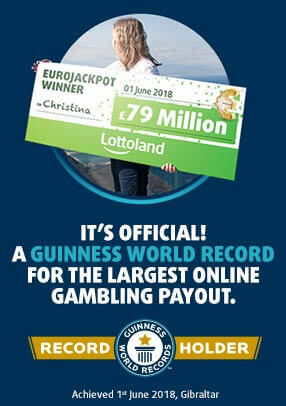 Lottoland now hold a Guinness World Record for the world’s largest ever online gambling payout, after a lucky Lottolander won an eye-watering £79 MILLION jackpot. Remember, with eye watering top prizes prizes regularly available on Millionaire, your bet could not only win a huge payout – it could smash our record right out the park!